'On a general level a priest naturally, and supernaturally, will want to smile into the eyes of those to whom he gives Holy Communion. [So this is for the priest's benefit, right?] It's a lot easier to do so if they are all joyfully singing the Communion song together with their heads thrown back [ie, without looking at a hymn book], in accordance with liturgical law [yes, a chant or song is allowed at Communion, well done Basil], rather than looking at the ground as they first of all bow, and then try to avoid being swiped by a redundant communion plate, as prescribed by rubrical nit-pickers [surely, 'liturgical law', which says that the 'Communion Plate is to be retained' (Redemptionis Sacramentum para 93) and the recommendation to make an 'act of reverence' before communion (Redemptionis Sacramentum 90)]. Mgr Basil Loftus, Catholic Times 19th May 2013. I kid you not. Is he finally losing his marbles? Does he really want to suggest that Bl Pope John Paul II, under whom those rubrical prescriptions were made in Redemptionem Sacramentum in 2004, was a joyless dictator to rival Erich Honecker, Kim Jong-Il, Stalin and Mao? Where are the gulags where dissidents were locked up to maintain this reign of terror? Oh, how silly of me! They were condemned to the ultimate torture: of writing perpetual articles in the Catholic Times. Actually, Basil, reading this stuff is the real torture, not writing it. I sometimes complain that it is not really my brief to defend the Novus Ordo; I mean I'm happy to do it, but why is it left to me? Why aren't all those 'conservative' Catholic bloggers defending these rubrics against Loftus and his ilk? I fancy they have given up. But you can't just give up: he's spewing this stuff out every week. Yet again this week - I think for the third time at least - he recounts the story of Pope Francis saying 'the carnival is over' to the Papal MC Mgr Marini, despite it long since being debunked as a malicious smear, above all a calumny against the Holy Father, who doesn't share Loftus' habit of unthinking rudeness. When is the madness of these articles going to end? Since I'm not a neo-conservative with the task of defending every detail of the Novus Ordo Missae ('Ordinary Form') and its associated legislation, I should add that Loftus is given an easier target by the awkwardness of the current liturgical settlement, if I may call it that. It is perfectly true that there is something a little unnatural and contrived about asking people to bow before receiving Holy Communion. Why not just have them kneel down? And it is also true that the is something a little unnatural and contrived about having a communion plate where practically everyone receives in the hand. These rubrics were ways of trying to claw something back from the disaster of the spread of, and then the permission for, the abuse of receiving Communion in the hand, and the novelty of receiving standing up. Those things didn't work, and trying to ameliorate them with these rubrics hasn't worked either. But then, the Novus Ordo manner of receiving on the tongue is awkward too: having to say 'Amen'. You can't make it clear that you are ready to receive - people tend to stick their tongues out, pull them in to say 'Amen', and then stick them out again. At least, this is what I seem to end up doing at the OF. 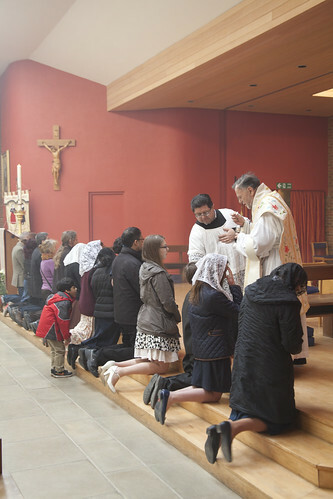 Say what you like about the Traditional Mass, it works. It works because it has developed to work, over many centuries, instead of being some kind of bureaucratic compromise in the midst of an endless liturgical war. Thank you for exposing Mgr Loftus' latest effusion to public view. I'd be happy - well, prepared - to take on the task of the weekly fisk, but not if it meant giving a single penny to the publishers of the Catholic Times, and my PP is a bit anti the idea of my simply taking a copy without paying for it. As you are well aware, but I am going to say it anyway that, the problem here is rooted with liberal Catholics misunderstanding of piety. After Vatican II modernisers promoted the idea that displays of piety were wrong. What did the reformers say to make Catholics believe that piety is bad? 1. They said that those being pious are really only 'acting holier than thou’. 2. These displays are not genuine and equate to the outward signs of the Pharisees. How do we know that they were wrong? One of the Gifts of the Holy Spirit is the Gift of Piety (alternative name - REVERENCE). Genuine piety is of God and ‘anti-piety’ is of man. When liberal Catholics stop the faithful being pious (whether or not they are being pious by 'gift or choice') they get in the way of God getting close to His people. To cut a long story short - these liberals Catholics place barriers between man and God. He's such a scream, isn't he? He makes you want to. By the way, I love the picture of the little chap peering through the wall of communicants. He's such good value. One of the hugest problems is the promotion of parishioners to the role of pseudo clerics. That needs to be sorted out. Until the rule of the beany hatted elderly ladies has passed, we'll be stuck with the shambolic mess we have at the moment with the OF. Don't underestimate the power of the 'ladies that do', who won't be told they can't. I'm surprised the Catholic Times hasn't dropped the Monsignor but I suppose they fear it would be difficult to fill column inches without him. Very irritating - I would buy it if he weren't in it. Speaking as a mere layman, I do not go to Communion to have the priest smile at me; I do it to encounter God. The only thing worth reading in the CT these days is Fr Nicholas Schofield's column. Even so, I don't buy it as the contemplation of a certain cleric's silly bearded face (not to mention the content of his articles) brings on the urge to commit acts of violence. Occasions of sin must be avoided.